Tutorial for Rhonda’s FAL is 3/4 of the way done, hope to get finished tonight. I used the fabulous Kerry’s teapot pattern from issue 8 of Fat Quarterly magazine (I used my birthday money from my granny to buy not only the next year’s subscriptions, but also the first 8, so I got to enjoy all the paper piecing fabulousness). 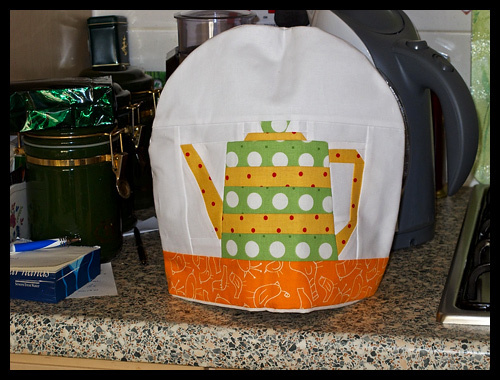 Kerry also has a pattern on her blog for a tea cosy, along with instructions, but as this one had to fit a coffee pot as well as a tea pot, I had to wing it on my own for this one (although really, there’s only a certain number of ways one can draw a standard tea cosy!) 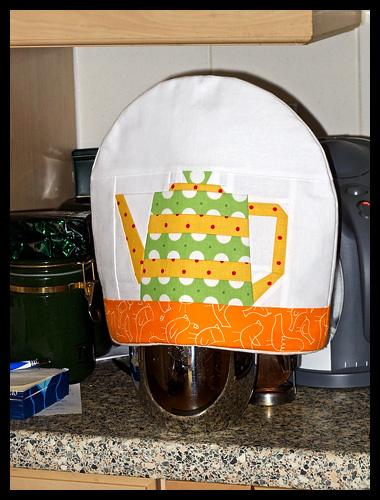 The tea cosy has a layer of woven interfacing on the outer side, holding a layer of insulated batting in place, and the lining is some muslin type fabric. 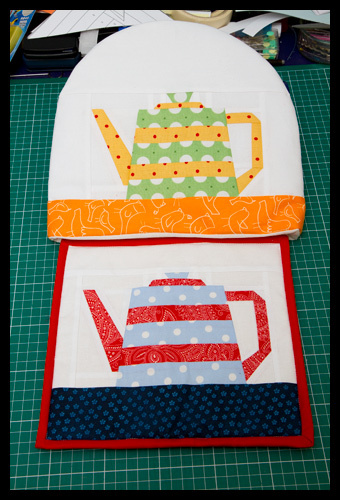 The tea pot/coffee pot stand has a layer of quilt batting under the tea pot piece, which has been echo quilted on, then a layer of the insulated batting, and backed with the same muslin. I used Klona white for the solid, Half Moon Modern for the green dots and red paisley, Delighted for the yellow with red dots (coincidentally Jenna sent this in her bee block pack and I thought it looked familiar until I went rummaging in my fat quarter stash for fabrics for this and came across it! ), Robert Kaufman’s Primatex Basics for the blue dots, Robert Kaufman’s On A Whim 2 for the orange birds and some random blue flowers from Mandors fat quarter section that has no selvedge on it… The binding on the stand is a red Egyptian cotton solid I picked up at the quilt fair recently. 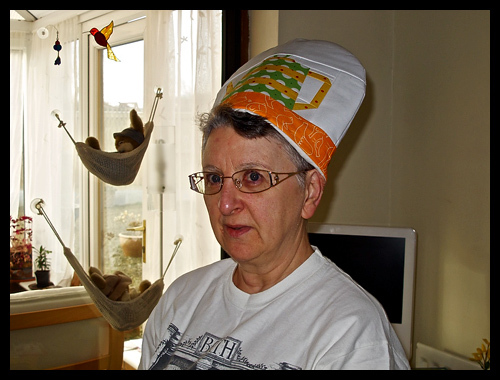 Mum tries on her new hat. She wonders if it will keep the sun off in India. Of course it works much better with the plunger down! No I am not drunk – my laptop went berserk!!! Your Mum is a hoot. The tea cozy is great, what a neat idea. LOL I see teddy bears in hammocks, too! Cute cozy! Happy Mother's Day to your mum! Awwww love the fimo bears!!! awe! how precious! haha can't wait to see your FAL post! looking forward to your pattern !! NOt teddy bears in hammocks but rabbits. The top one decided it was spring to-day and decided to jump out! Very sweet! I like the paper piecing a lot. 🙂 Where in India is your mom traveling? Well I know where you get your amazing sense of humour from but really I would love a photo of your mum in the cozie and the skirt!! The tea cosy came out fabulous! Great job! Loved the picture of your mum. It's Mothers Day here in May too. The teapot cosies are lovely, as are your Fimo bears. Maybe you should make your mum a nice big sun hat! Hope you all had a nice Mother's Day. Oh I do love your Mum. She does not mind the Micky being taken out of her. 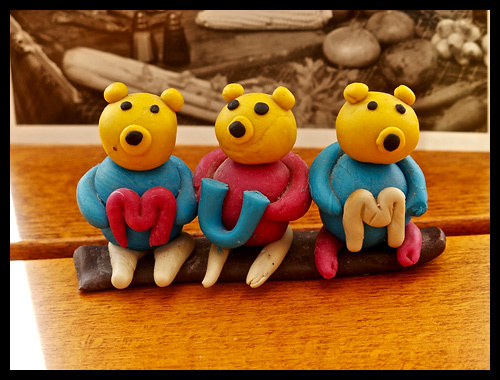 I spy with my little eye bears…..
Tee hee – good sport your mum! I love your mum. She and I would get along great as we have the same sense of humor. Her gifts turned out wonderfully including the darling bears from your younger years. And a weekend where you have nothing to do but sew? Sign me up!